Trump and Obama's "dumb deals"
Just a few days after entering the White House, and a very recent convert to geo-political affairs, President Trump was obviously unaware of the plan that there was behind the US-Australian refugee deal. And couldn’t appreciate the political meaning and value to US diplomacy of taking 1,250 Muslims on US soil. “I will study this dumb deal”, Trump said after a harsh conversation with Australian PM Malcom Turnbull, who had mentioned an Obama-era agreement by which Washington has accepted to take and resettle in the US 1,250 Muslim refugees, mainly of Rohingya ethnicity, presently stranded in two detention camps in Nauru and Manus, near the coast of Papua-New Guinea. And indeed he should study the question. Or rather, he should have studied it before improvising a discussion with the more experienced Mr. Turnbull. Because, if he refuses to keep Obama’s engagements, and resettle the refugees, he might be doing a big favor to the very country that he has identified as the main object of American hostility: the People’s Republic of China. In order to understand what there is behind this story, and why Trump should have avoided, at least in this occasion, to express his well known stand about too many refugees coming in the USA, one has to take two steps back to the complex situation in the country most of these refugees come from: Myanmar, also know – since the times of the British Empire – as Burma. An ethnically very complex country, ridden by decades long wars among tribal and minority armies, and strategically located between China and the Indian Ocean. Since the mid 20th century, Myanmar geographical location, coupled with the political consequences of the Second World War, that had brought about the end of the British Empire the defeat of Japan, and the triumph of Mao’s Communist Party in China, had made that the country had lived in Beijing’s shadow. Only quite recently, a “regime change”, long prepared by a number of Soros-financed NGOs, educational and “humanitarian” organizations, has succeed in making the famous Nobel Peace Prize holder Aung San Suu Ky the de-facto ruler of the country. And has dealt a little-known blow to the People’s Republic of China. A little-known blow, but an extremely serious and dangerous one in both, political/prestige, and economic-strategic terms. In order to assess the blow to China from a prestige and political viewpoint, one has indeed to look at Ms Aung San Suu Ky family background. Not only she has openly shown her preference for the West by marrying a Briton, and letting her children to keep being British subjects. Her Burmese side is also very meaningful; actually, much more meaningful. Because her father, thakin (i.e Master, a title with a clear racist connotation) Aung San, who is still today considered the “Father of the Nation”, had been in 1938 the founder (and for three years the Political Secretary) of the Burmese Communist Party, but had changed side in 1941, and had become the Chief of the Burmese forces fighting on Japan’s side. It has to be said that he probably did that out of misguided patriotism, as he probably had become convinced that the Japanese were the only force that could deliver Asia, and his country, from British colonial rule. But his anti-colonialist engagement brought him too far: as far as accepting to be decorated by the Mikado himself with the highest Japanese military honors: something the Chinese – who were then under ferocious Japanese oppression – have obviously not forgotten. As hadn’t forgotten Lord Mountbatten, the last Vice-Roy of India, who managed to have him assassinated in 1947. All this added up, in the eyes of most, if not all Asians, to a fairly obvious conclusion: with Aung San Suu Ky rise to power, “regime change” had moved Myanmar from the Chinese sphere of influences, to that of Japan. And this, at the very time when, in Tokyo, the helm is in the hands of a new Prime Minister, Shinzo Abe, who has been working to expand the international role of Japan, as well as of the country’s Self Defence Forces, in the framework of a “re-interpretation” of the post-war Constitution that would from now on allow Japan to “come to the aid” of other nations under attack, even if Japan itself is not. From an economic and strategic viewpoint, Myanmar’s shift towards the area of influence of countries (not only Japan, but its allies as well, including the US) that seem every single day closer to the possibility of becoming hostile to Beijing, present more than just a danger: actually, are a present and serious loss, as it risks drastically reduceing China’s access to the Indian Ocean. In spite of all the fuss about the South China Sea, about its islands (natural and man-made), and about the conflicting claims of all the countries that touch at it, the harsh reality is that, from a geo-strategic viewpoint – China is in trap; and would stay trapped even if Beijing got its way in all of the disputes, actual or possible. The great Chinese ports are all on a closed sea, and oil tankers as well as all big ships have only three possible way of accessing international waters: the International Malacca Strait; and the Sunda and Lubbock channels, which are in Indonesian national waters. In simple words, even in times of peace, China suffers from a dramatic strategic inferiority. 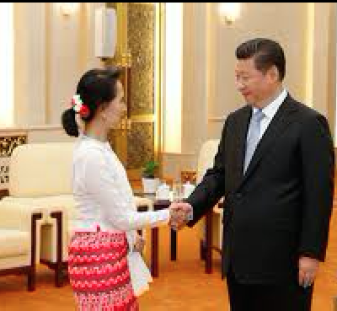 Friendly relations with Myanmar, are therefore of outmost importance for China, in order to access, albeit indirectly, to the open seas. 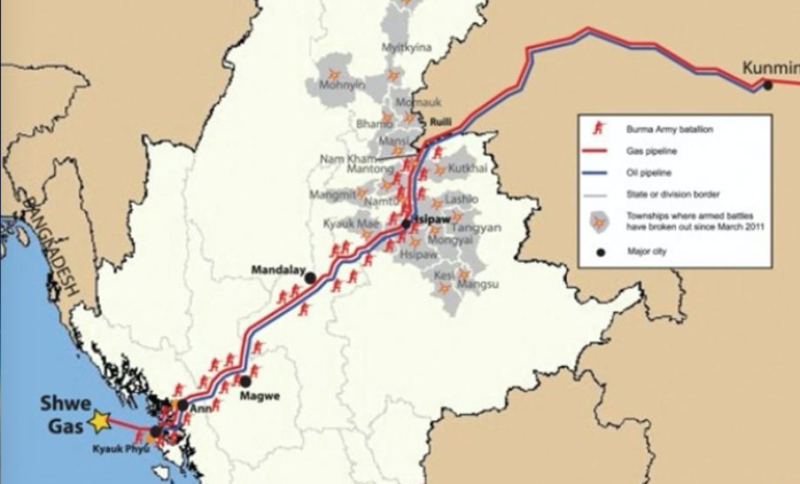 Before Aung arrival to power, late in 2015, both an oil and a gas pipeline, that had been agreed between the two countries back in December 2008, had begun operating These are giani undertaking, both technologically and politically, who run through two of Southeast Asia’s political hotspots, the Rakhine and Shan States, which retain semi-autonomous armies and have only just recently been nominally pacified. It is a that stage that, all of a sudden, the bad relations between the very aggressive Buddist majority of Burma and the Muslim Rahingya minority have become an issue of international interest. Disturbances have started occurring in the Rahingya-populated area of Myanmar, where the flames of hatred are being strongly fanned by a yet unknon hand. Most recent, and most criminal, on January 29th, 2017 has been the assassination of a very prominent Rohngya lawyer, Ko Ni, one of Aung San Suu Kyi closest and most influencial advisers, in her effort to combat religeous and ethnic hatred, and strengthen Myanmar’s national unity, against the separatists ideas that are being spread for the creation of a Rohingya independent entity. 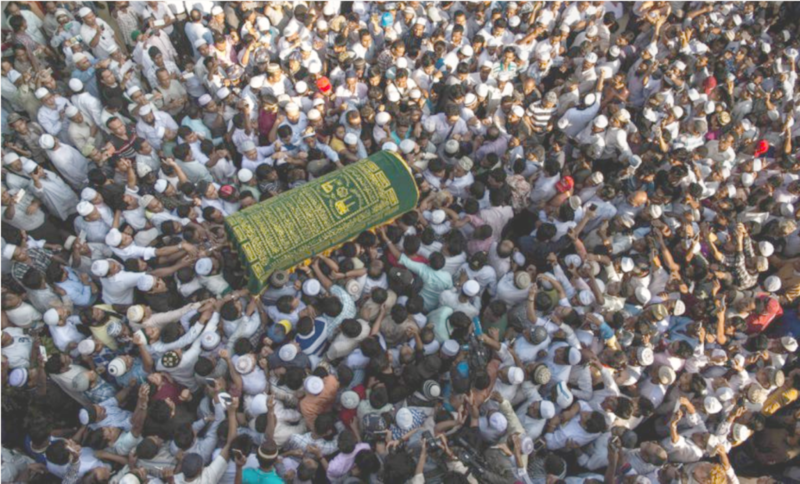 Mourners at the Muslim cemetery in Rangoon carry the coffin of Ko Ni. Needless to say, the “politically correct” press has thrived on the existence of this new political and humanitarian crisis: the Rahingya crisis; that is, a crisis that involves a community that inhabits the very costal area that is crucial to sino-burmese cooperation. All of a sudden, very moving articles have appeared in the media about the plight of the Rahingya and about how “the international community has a moral imperative to support ” them, and how ”the persistent repression and lack of representation suffered by the Rohingya gives them a right in their own state”. Even Forbes has encouraged its western readership to “Sanction Myanmar And Give The Rohingya A State Of Their Own”, but has deemed a detail not worth of being mentioned the fact that the Rahingya live in a coastal area of outmost geo-political relevance. Which means that, once this new Nation having been built, the US would have the “moral obligation” of protecting it from “sanctioned” Myanmar with a permanent military deployment. Recently converted to geo-political affairs, President Trump was obviously unaware of this background story. 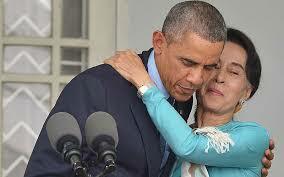 And couldn’t appreciate the political meaning and value to US diplomacy of taking 1,250 Muslims Rahingya on US soil. By now he has probably been informed, and has understood that Obama’s “dumb deal” was not that dumb after all, in the anti-Chinese perspetive of the “pivot” to Asia. But should he, in his anti-refugee furor, remain “insensitive to the plight” of the Rahingya stranded in Nauru and Manus, and to the larger and more general “moral obligation” of giving them a country of their own, he would miss the opportunity of manufacturing international consensus for the creation on the Myanmar coast of a permanently conflictual situation that might inflict and extremely serious blow to China’s growth, and become a very serious irritant for the very country the new US President has spotted as the present, main enemy of America.